Some days I crave more than just food for dinner. Trapped within the monotonous confines of a college budget, the complexity of my meals often takse a hit. While I creatively maintain a balanced diet of vegetables, starches and proteins, in cooking for one here in my dorm kitchen, I have been missing the sentiment of cooking for a family as I did throughout middle and high school. With this sentiment in mind, I pulled together a meal that brought gourmet to the simple family dinner. It started with a desire for potatoes. Leaping out of the seemingly endless loop of rice and pasta, I went to the local market in order to build a week of eating around this one item. Like always, I then allowed the price and availability of fresh produce dictate my meal’s direction. Just past the potatoes I found fresh green beans on sale for just 99 cents a pound. Edging on a more rustic path in light of the frigid winter temperatures here in Manhattan, I chose an extra large carrot and a full bunch of fresh rosemary, the ultimate herb for all seasons. Picking up some milk and butter, I decided to transform the potatoes into one of my favorite simple dishes, mashed potatoes. Every week amongst all of my savings I try to treat myself to something special at the grocery store. Usually that something extra is a compromise between a special cheese or a meat for the week but taking things out of order in the grocery store, I ended up with both. Smoked gouda is a cheese I am quite familiar with. First introduced to it as I prepared a special four-cheese blend of macaroni and cheese for Christmas years ago, its deep and smoky flavor dominates any dish it is a part of. Considering the classic family meal I was building, a roast chicken would be the perfect piece to finish the meal. With fresh rosemary already in my basket, I ran over to pick up a lemon for the chicken and went cheerfully from the grocery store ready to make the ultimate meal. 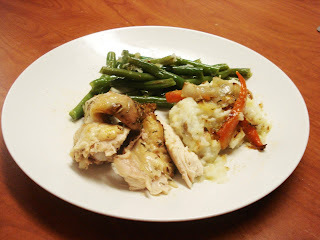 Roast Chicken is one of the most important dishes you could ever learn to cook as a college student. With a relatively low amount of active preparation time, roast chicken bakes in the oven as you prepare the rest of the meal or return to your studies. Further, because the chicken is handled far less than trimmed cutlets or cut chickens, it has the lowest price per pound amongst chicken parts. And, while you can eat the dark meat and wings at sit down meals throughout the week, the breast meat of a well-seasoned chicken is excellent in sandwiches or salads simply cut or as the meat for chicken salad. To lock the juices in my chicken and ensure that my chicken wouldn’t dry out in a week of leftovers, I started my meal by brining the chicken. If you are in a hurry, you can skip this step, but I recommend against it. After brining the chicken, it is important to rinse the chicken well to avoid a overly salty taste in the finished product. Butterflying chicken reduces the cooking time of poultry by flattening the bird and doing away with the center cavity which complicates the heat distribution inside the chicken. It is also makes every surface of the bird easy to season. Using a large sharp knife or a pair of poultry scissors, cut along one side of the backbone (on the bony side, not the breast side) from neck to rear, breaking the bones and opening the cavity. Use downward force to cut, not a sawing motion. Rotate the bird as needed to grasp the other side of the backbone and repeat the cut to remove the backbone. Note: because you have lost the surface stability with the first cut, be very careful as you force through the ribs not to chop through to the other side. Sometimes it helps to roll the bird and place the backbone flat on your cutting board. Open up and flatten the bird. By using fresh aromatic vegetables under the chicken, this recipe adds a layer of flavors which are impossible in traditional cooking methods. 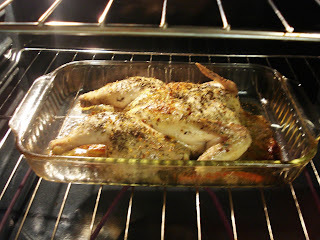 Remove from the oven in about an hour. Always allow the chicken to rest for about 10 minutes before cutting to ensure that the juices do not run from the bird and cause dry meat. Usually mashed potatoes don’t keep in the refrigerator very well because their flavor rests wholly on the freshness of the potatoes. While this flaw is often settled by the integration of roasted garlic, the recipe below is a subtle cross with macaroni and cheese as smoked gouda is folded into the creamy potatoes to lend smokiness to the dish. A very simple preparation of green beans, the same general techniques of this dish also work well with squash and zucchini. When buying the beans, pay attention as you grab handfuls and only choose bright green, firm beans that are consistent in thickness. too complicated! long live rachel ray! AAAHHHH…never mention that woman. LOL. It really isn’t hard to make. I was trying to use a more complex recipe to teach more techniques of the process. Robyn, It was great to meet you at the ECC symposium! Good luck over the summer. I just want to say I am just newbie to blogs and absolutely loved this blog. Almost certainly I’m planning to bookmark your website . You really come with beneficial well written articles. Thanks a lot for sharing your web page.